On your way down Center Road, watch for the old Lebanon Town Pound. It was constructed in 1813 and restored in 2001 by The Lebanon Historical Society. Town pounds were used in the past for animals that had strayed from their owner's farm. When are the peaches usually ready? The peaches are usually ripe mid-August. In 2018 we had a very short peach picking season due to a small crop. It ended officially on Tuesday, August 21, 2018. In the future if you are traveling a long distance, we recommend calling the farm before heading out to confirm that we are open and find out what the latest status is on the peaches. Conditions can vary from day to day and even hour to hour. We do our best to post updates to our website and Facebook pages. The farm number is 207-457-1435. When are the blueberries going to be ripe? We generally open for blueberry picking around July 15. For more information on our exact opening date you can: phone the farm at 207-457-1435; visit our Home page; or visit our Facebook page. You can also subscribe to our email list to receive email notifications when each fruit ripens. Can I bring my dog to the farm? NO, with the exception of service dogs. Sorry, we do not allow dogs on the farm--not even left in your parked car. There is no shady parking and your pet will be more comfortable if left at home. Farm Speed Limit, Please drive slowly and beware of small kids and dogs. To ensure that everyone has a nice, relaxing time when visiting the farm, please obey the farm speed limit of 5mph anywhere on the property. We are a family-friendly farm and there may be small children or our farm dogs anywhere at any time. What do we do in the winter? Answer: In the winter we enjoy traveling, going out to breakfast, and volunteering with several different local organizations. And then in the spring most of our time is spent getting ready for the next picking season. Answer: In season, we open on Tuesday nights until 7:00pm. Other nights we close at 5:00pm. We are closed on Mondays. What is the difference between low bush "wild" blueberries and high bush "cultivated" blueberries? Wild blueberries grow naturally along the Maine coast, especially in the "Down East" area. These berries are small and grow close to the ground. Maine is the #1 world wild blueberry producer. These berries are picked primarily for the frozen and processed market. Cultivated high bush blueberries were developed by researchers 60 - 70 years ago by selectively breeding "wild" high bush blueberries. These are now often referred to as the "BIG" berries. These are marketed as fresh berries and are what you are picking here at Berry Best Farm. We have eleven different varieties that extend the ripening season from mid-July through August. Do they taste the same? Yes, but many people prefer one over the other. They are nutritionally the same! Should we bring our own containers? Answer: We provide picking buckets, but if you want to bring your own container, you can. Should we phone the farm before we come? Yes! Answer: It takes just a moment to give us a call before heading out. You can check on that day's picking conditions. We highly recommend calling to confirm we are open if you are driving a long distance. We are a small, family-run farm and may need to close the farm unexpectedly due to weather, etc. Our phone number is 207-457-1435. Is the fruit grown organically? Answer: No, we do spray our fruit as needed to control certain pests. All of our fruit is grown using minimal amounts of herbicides and pesticides. We use IPM (integrated pest management), low-spray conventional agricultural practices. Have you been in the field happily picking your berries and wondered what on earth is making the screeching sound? Birds love blueberries and can "harvest" up to 10 percent of our crop! They "pick" early morning and early evening when you are not there. We have added this electronic bird alarm system to serve as a deterrent for the flocking birds such as Starlings. The screeching sound simulates a bird in distress, hopefully keeping the birds away. It is only partly effective however. What else can we do when we visit the farm? 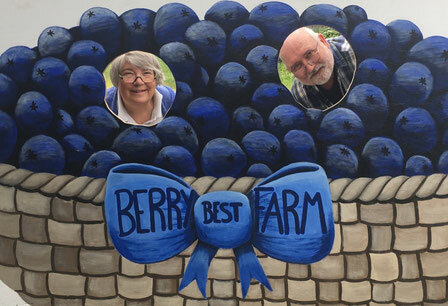 Take a Photo in our new Blueberry Basket sign: A local artist painted a beautiful blueberry basket cutout board for photos. It makes a great souvenir of your day spent at the farm. Take a Stroll: Take a half-hour stroll through the woods on our new forest trail. Pick up a map at the farm store before heading out. Bring a Picnic Lunch: We have a large picnic table adjacent to the fields if you would like to bring a lunch. Visit the Town Pound: Stop and see the Lebanon Town Pound on your way down Center Road. A stone structure built in 1813 to hold stray farm animals. Play Some Golf: You will pass Lebanon Pines Golf Course on your way down Center Road coming to the farm. It is a great low-key place to play nine holes. We would like to bring a picnic lunch. Is that OK? Answer: We have one very large picnic table you are welcome to use. How do I freeze blueberries? Answer: You can enjoy our berries all year 'round by freezing them. Just spread fresh berries out on a cooking sheet one layer thick and put them in the freezer for a few hours. Do not wash berries! After they are frozen you can put the berries into a freezer storage bag and store the freezer. You can have delicious berries all through the winter! Is the farm handicapped accessible? Answer: Yes, with permission in advance, you are able to drive your car to the edge of the blueberry fields. Answer: Yes, we have a frequently maintained porta-potty.